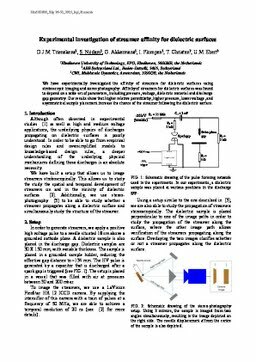 We have experimentally investigated the affinity of streamers for dielectric surfaces using stroboscopic imaging and stereo photography. Affinity of streamers for dielectric surfaces was found to depend on a wide set of parameters, including pressure, voltage, dielectric material and discharge gap geometry. Our results show that higher relative permittivity, higher pressure, lower voltage, an d asymmetrical sample placement increase the chance of the streamer following the dielectric surface. Trienekens, D.J.M, Nijdam, S, Akkermans, G, Plompen, I, Christen, T, & Ebert, U. M. (2015). Experimental investigation of streamer affinity for dielectric surfaces . In Proceedings of International Conference on Phenomena in Ionized Gases 2015 (ICPIG 32) (pp. 1–4).